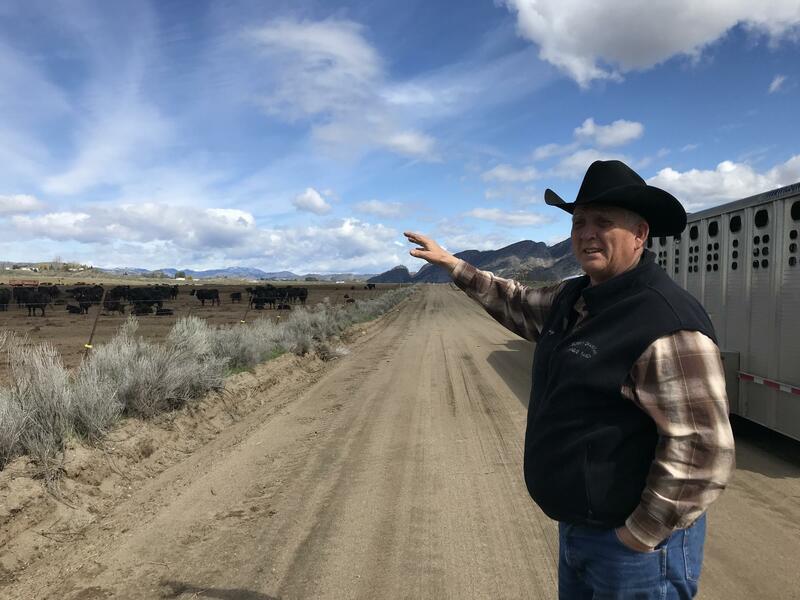 "We thought we had somebody on our side and now Zinke pulls this on us," rancher Craig Verasjka says. "We're not happy." Some ranchers in Washington state fear reintroducing grizzlies, like this one seen in Alaska, will bring a "catastrophic" threat to their livelihood. Okanogan County Commissioner Jim Detro says urban environmentalists want to reintroduce the bears with little regard for people in rural areas who will have to deal with the consequences. Rancher Craig Verasjka enthusiastically voted for Donald Trump and his support for the president's interior secretary, Ryan Zinke, had been unwavering. Finally, he recalled thinking after the election, when making land management decisions the federal government might give a friendlier ear to rural Americans who rely on public lands to make a living. That honeymoon appeared to end abruptly this Spring, however, when Secretary Zinke paid a surprise visit to North Cascades National Park, announcing he was restarting a stalled Obama-era plan to reintroduce grizzly bears. "What the hell do we do? We thought we had somebody on our side and now Zinke pulls this on us," Verasjka says, "We're not happy." On a recent chilly morning, Verasjka was tending to his cows in one of his winter pastures near Omak, Wash. The snow-capped Cascades loomed in the distance off to the west. When the snow melts, the cattle are moved into the mountains where Verasjka holds permits for grazing on U.S. Forest Service land abutting the national park. 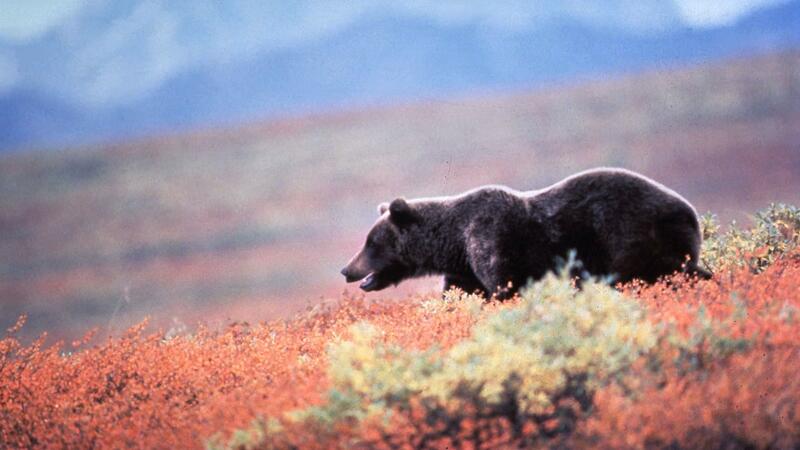 It's near the same area where an estimated 200 grizzlies could soon be reintroduced into the wild. "It'll be catastrophic," Verasjka says, who considers the predators a potential threat to his livelihood. They'll kill his cows, he fears, or at the very least stress them, keeping them on the move and deterring them from breeding. "I mean the guy [Zinke] flies to the Northwest in a 48-hour period and makes a decision like that not consulting a person like myself who's spent a lifetime here," Verasjka says. There is anxiety over grizzlies in remote central Washington's Okanogan County, a large river-carved plateau of sage brush country about 40 miles south of the Canadian border. Ranchers like Verasjka worry the bears will roam east of the mountains looking for food. The county is also home to some of Washington's most productive and lucrative fruit orchards. And some locals will tell you privately they feel like they're being scapegoated by the interior secretary, who needs an environmental "win," they say, after presiding over a historic reduction in federal land protections at two national monuments in Utah. A Zinke spokeswoman declined an interview request by NPR. But when the former Montana congressman visited North Cascades National Park in March, he said he grew up around grizzlies and had great respect for them. "I'm in support of the great bear," Zinke said. "I'm also in support of doing it right, this is not the reintroduction of a rabbit." Grizzly reintroduction in the Cascades is far from a done deal, however. And the bears' possible impact on cattle is just one of a list of issues to be addressed in a revised environmental review by the Department of Interior. Zinke acknowledged to the small crowd of reporters and invited guests assembled that day that it may take people in Washington a little time to adjust to having the bears around. There have been a few sightings of the occasional grizzly wandering into the state from British Columbia, mostly on the west side of the Cascades, and very few since the 1990s. East of the mountains, people still talk about a famed grizzly that reportedly "terrorized" the area back in 1958. 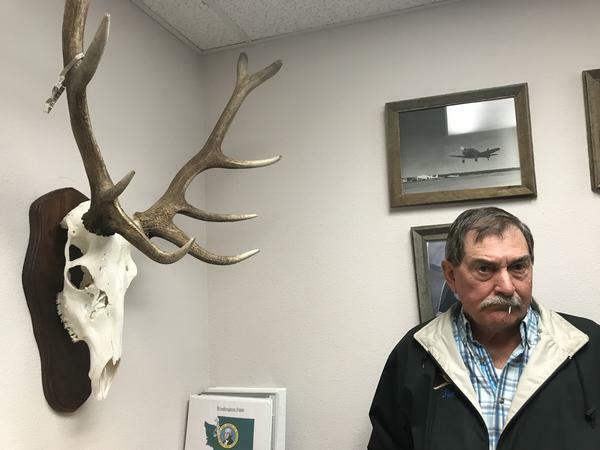 In his office, Okanogan County Commissioner Jim Detro keeps an old cast mold of its large paw print alongside a local newspaper article recounting the bear's clashes with local cattlemen. "I can run out on my back porch and scream and scare the hell out of a black bear, you're not going to do that with a grizzly bear," Detro says. "They'll hunt you up." Detro was not invited to the secretary's announcement, nor were many other county commissioners from around the region. He says that unlike in the secretary's home state, there are too many people and too many businesses living too close to where the grizzlies could roam. But Detro also speculates there's a broader agenda to reintroduce them being pushed by environmentalists in well-heeled cities like Seattle. "We could all get along if those guys weren't over here trying to ram their idea of how we should live down our throat," Detro says. In interviews, environmentalists in the Northwest say they were just as surprised by Zinke's announcement as officials in Okanogan County. And they say there is plenty of room for a couple hundred grizzlies in a recovery zone that encompasses an estimated 10,000 square miles. "Grizzly bears are not man-eaters," says Joe Scott of Conservation Northwest. Scott says grizzlies generally avoid humans unless we give them a reason to be a nuisance, like leaving trash out. In states to the east of here that have grizzlies, namely around Yellowstone and Glacier national parks, Scott says problem bears are dealt with quickly. The recovery of the once endangered grizzlies in that region has largely been seen as a success by the federal government. At least one state is even planning to resume hunting of the animals. Meanwhile, not everyone in Okanogan County is fuming over the DOI's surprise announcement either. Central Washington is also home to a large Native American population, and some tribal members were encouraged by the secretary's announcement, particularly his recognition that tribes consider grizzlies sacred. The bears symbolize strength and courage, according to Lorrie Sue Nelson, a descendant of the Colville Tribes who lives and works in Omak, Wash.
"They have the right to be here before any other species because they were indigenous to this area since the beginning of time," Nelson says. Nelson says she recognizes that farming and ranching are hugely important to the area's economy, but those things came later, with little say or input from her people. "The invader here is the cattle industry," Nelson says. Secretary Zinke has said he wants a final decision made by the end of the year. Grizzly bears may be on their way back to rural Washington state. The Trump administration is thinking about reintroducing the predators just south of the Canadian border and about 100 miles north of Seattle. And rural farmers and ranchers are gearing up for a fight. During a reporting trip there, NPR's Kirk Siegler discovered the looming battle is about a lot more than grizzly bears. KIRK SIEGLER, BYLINE: This is a story about reintroducing a grizzly bear to a state where they were eradicated years ago, but it's also about something a lot bigger. Listen to these two polar opposite views of grizzlies to understand why. JOE SCOTT: Sheer inspiration and wonder - that's what grizzly bears do for people. SIEGLER: This is environmentalist Joe Scott who lives in Bellingham, Wash., north of Seattle. Next is Jim Detro, who lives on the more rural, east side of the Cascade Mountains. JIM DETRO: I can run out on my back porch and scream and scare the hell out of a black bear. You're not going to do that with a grizzly bear. SIEGLER: They'll hunt you down, he says. Now, playing out in these two vastly different views of the same bear is the country's urban-rural divide, or at least a version of it. First, let's start in Jim Detro's home town, remote Okanogan, Wash. He's a county commissioner here. And in his office, there are stuffed cougars, bighorn sheep and deer he's hunted mounted on the walls. In a shoebox he keeps in his desk drawer, there's also a giant mold of a bear claw. DETRO: There we go, but that's a plaster Paris cast of the Tongue Creek grizzler (ph). SIEGLER: The Tongue Creek grizzly, an infamous griz (ph) that he says terrorized this area in 1958. DETRO: They hunted that bear, and nobody ever got him, and he was just on a rampage through here killing livestock and eventually left. SIEGLER: Now, Detro is worried that if the feds reintroduce the bears, there will be more economic havoc in this river-cut valley with its cattle but also its lucrative fruit orchards and tourism and vacation home industries. He says grizzly reintroduction to Washington state is being pushed by deep-pocketed environmentalists on the other side of the Cascades in Seattle. DETRO: They have this grandiose idea that there's this vast wilderness out there that's part of theirs because it's public land that they can go to, but we that live here don't have a right to live here. SIEGLER: Detro says people in cities like to cut checks for feel-good environmental causes, but they're not the ones who actually live out here off the land and have to deal with the consequences. DETRO: Well, a friend of mine that's a rancher coined a phrase asphalite. You know what that is? That's a person that is born and raised on concrete and asphalt, has no common sense whatsoever and gets up every single morning and drinks the green Kool-Aid. SIEGLER: It can feel like two parallel universes when you travel from rural Okanogan County over the mountains to the more well-heeled Seattle area. It's a place famous for its liberal activism and Patagonia-clad population that flocks to the Cascades to backcountry ski or hike. SCOTT: People in urban areas do spend a lot of time in places where the bears will be. SIEGLER: Joe Scott, the environmentalist we heard from earlier, is showing me the edge of what would be the grizzly bear recovery zone in the Mt. Baker-Snoqualmie National Forest. SCOTT: Yeah, that gives you a little preview into what's in the backcountry. You can see steep mountains and heavy snows in the background. SIEGLER: Scott takes offense to the argument that people who live in more urban places are somehow disconnected from these wild areas. He's skied, camped and bushwhacked his way through these rugged mountains, and he says there's plenty of room for a couple hundred grizzlies. SCOTT: Grizzly bears are not man-eaters (laughter). SIEGLER: Scott says grizzlies avoid humans unless we give them a reason to be a nuisance, like when we leave trash out. And in states to the east of here that have grizzlies, like around Yellowstone or Glacier Parks, problem bears tend to get dealt with swiftly. SCOTT: You know, we hear a lot from people that this is just another federal intrusion to push an urban agenda. Well, first of all, the federal government is following the law. SIEGLER: Federal law says a species at the brink of extinction must be protected. Now, the environmentalists got to go to the invite-only announcement by President Trump's interior secretary, Ryan Zinke, that the grizzly plan was being restarted. RYAN ZINKE: I played for the Ducks. SIEGLER: Over on the other side of the urban-rural divide on the eastern slopes of the Cascades, people told me they weren't invited and felt blindsided. They thought this Obama-era plan was dead. CRAIG VERASJKA: What the hell do we do? You know, we thought we had somebody on our side, and now Zinke pulls this on us. We're not happy. SIEGLER: This is Craig Verasjka, a rancher and enthusiastic Trump supporter. He grew up with Jim Detro, the county commissioner who showed me that bear claw print earlier. We're out in one of his pastures where his cows spent the winter. VERASJKA: They think because I stop with the trailer, they think I'm going to come feed them (laughter) you know? SIEGLER: And once the snow melts up high, he'll move these cows up into the lush Cascades where they'll graze for the summer near where the grizzlies would be reintroduced. He thinks they'll kill his cows or at the very least keep them stressed and moving, not breeding. Now, Verasjka is so frustrated because he says Secretary Zinke had pledged to better listen to rural voices like his when it comes to public lands decisions. VERASJKA: I mean, the guy flies to the northwest in a 48-hour period and makes a decision like that, to my knowledge, not consulting a person like myself who spent a lifetime here. SIEGLER: A Zinke spokeswoman declined an interview request by NPR. But the secretary has said he, quote, "supports the great bear" and in particular its cultural significance to area tribes. And here's where that urban-rural divide issue and how it relates to the grizzly bear debate gets complicated. It's clear not everyone in a city or everyone in a rural area fits neatly on one side of this divide or the other. LORRIE SUE NELSON: In my language, we say (speaking Salish). SIEGLER: Before I left rural Okanogan, I met Lorrie Sue Nelson. She's speaking in her native Salish here. Nelson is a descendant of the Colville Tribes of central Washington. They consider the grizzly sacred and want to see it brought back. NELSON: They have the right to be here before any other species because they were indigenous to this area since the beginning of time. SIEGLER: A final decision on grizzly reintroduction is expected by the end of the year. Kirk Siegler, NPR News, Okanogan, Wash. Transcript provided by NPR, Copyright NPR.